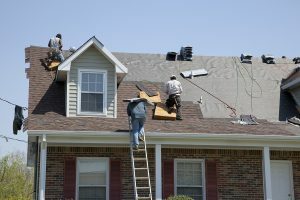 Making sure the roof on your Omaha, Nebraska, home is in good working condition is one of the most important things you can do retain your home’s beauty and value. If there are spots on your roof that are leaking, warped, or rotting, addressing these issues sooner rather than later could spare you the cost and hassle of having your entire roof replaced. Elite Exteriors provides dependable roof repair services to homeowners throughout the Omaha area, and our skilled technicians can ensure that your roof — and ultimately your home — is performing as it should. We’ve all heard the old saying: A stitch in time saves nine, and when it comes to roofing, these words could not be more spot-on. By making any necessary repairs to your roof before they get out of hand, you can not only avoid having to install a whole new roof, but you can prevent potential water damage to your home’s underlayment, rafters, joists, and other parts of your attic. If a limb has fallen down onto your roof in a recent storm, or if your gutters have been clogging up and causing ice dams to form on the edge of your roof, it would be wise to contact Elite Exteriors for an inspection. Not only are our experienced technicians trained to spot nearly imperceptible damage that other inspectors often miss, but they are also well-versed in local building codes and qualified to repair a variety of superficial and structural roof issues. We understand that when you’re having issues with your roof, there’s no time to waste, which is why we offer prompt and professional roof repair services. Our technicians are all highly trained and certified by trusted roofing companies including IKO and Malarkey, so when you partner with us to have your roof repaired, you can be confident that the entire job – from assessment to repairs – will be completed with the utmost expertise. To learn more about the roof repair services we offer to homeowners in the Omaha area, contact Elite Exteriors today. Contact Us to Find Out More About Our Special Offers! Let Us Help With Your Next Roofing Project!